We will photograph entrants BY REQUEST ONLY during competition on Friday, Saturday and Sunday. Make sure you fill out the information below or stop by our table to sign-up to be photographed. We will also be doing mini portrait sessions early in the morning or after the last run of the day. Stop by the table or email us about availability. Images will be posted by Friday, March 17 and we will email all when they are ready. We will also be doing mini portrait sessions early in the morning and after the trial in the evening. Stop by the table and ask about availability. Images will NOT be posted on our website. Please make sure you place your order before you leave the trial. We will photograph ALL entrants in the AKC Classic Competition on Saturday and Sunday BUT the ODTC pre-trial will be photographed BY REQUEST ONLY. If you would like images taken in the ring, please sign-up in the form below. We will also have our studio set-up in the Obedience area Wednesday through Sunday. Click HERE for more information on a FREE mini portrait session or to sign-up ahead of time. Links to images will be posted on this page by Friday, December 23. You will receive an email when the images are posted. There will be an Early Bird Discount applied to Action image orders in the first five days of being on the website. Portraits are not discounted. We will be photographing all competitors during Nationals. There is no need to sign-up unless you want a portrait session or you would like to be photographed during the ODTC pre-trial. You can sign-up for a portrait to the left or click HERE to sign up for action images during the ODTC pre-trial. There will be a 15% Early Bird Discount applied to Action image orders until Midnight on December 30, 2016 EST. Portraits are not discounted. There will be a 15% Early Bird Discount applied to Action images ordered before midnight EDT on Tuesday, July 5, 2016. Portraits are not discounted. Phone and email orders are also not eligible for discount. Thursday, March 23 we will be taking portraits from 9am - 4pm. If you want a session on Thursday and you did not book a session ahead of time, we will take walk-ups, first come first served, in between the scheduled sessions. Friday, Saturday, and Sunday we will be taking portraits after ALL competition rings are finished, during tabulations. These spots are first come first served. We will also be available after awards presentation but this time is reserved for people with awards. We will be happy to do more regular portraits after the awards portraits are done. We will try to photograph ALL entrants during competition on Sunday but run-throughs on Saturday are By Request Only. See one of our Photographers or stop by the table and let us know at least 4 dogs ahead of you. Portrait Sessions for DOCOF are now available! Choose your day and time below and complete the questions asked. Private Sessions are available for Friday 4:30pm-6:30pm or Saturday 9:00am-5pm. Sunday is only available after awards presentation and will be first come first served. Additional information below scheduler. TEAM portraits are available on Sunday during lunch (only 8 slots available) or after rings are done. Only lunch sessions are necessary to sign-up for and you can do that below. Otherwise we will take teams as they are ready, first come first served. Additional information below scheduler. Each owner may have a free mini session in our studio-set. Additional time is available for a small fee. We will photograph classic portraits of your pet in a variety of poses. You may be in the portraits, if you choose. Please let us know of any special poses, looks, tricks or personality traits you’d like for us to capture. You may view proofs and place your order on the website when the rest of the Action Images are posted. Prints from portrait sessions are not discounted. Minimum purchase is an 8x10 for $30. The complete price list is on the table (and posted to the right). We accept cash, checks, Visa, M/C and PayPal. We only create custom prints ~ all are optimized and cropped (upon request), then printed by a professional lab. Portraits look beautiful on canvas (custom frame also available). Custom collages, digital retouch, holiday cards, shirts, mugs and license plates also available. 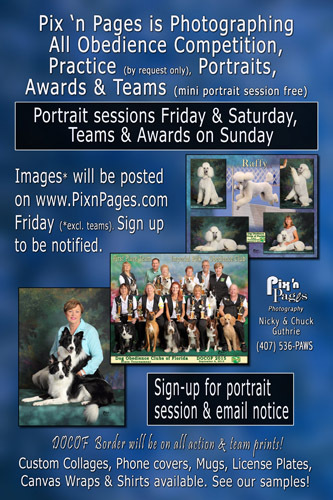 Sign up early for the best times – sign-up sheet available at Pix ‘n Pages’ booth. Each team (9 handlers and dogs) will be photographed separately. All team photos will be taken in our special set. A custom, “optimized,” team portrait will be created for each team with the best poses of each dog and handler (chosen from the multiple photographs). Team photos will not be printed as proofs or posted on the web site (because the final portrait will be created). The final team portrait will include the team’s name (if wanted) and have the commemorative DOCOF border at no extra charge. Due to the work involved with creating the “best” team photo possible, they will only be available for purchase as a package - one print per person in the photo. One person must order the package for the entire team, with one payment. 2016 DOCOF Border - will be on all action images unless requested otherwise. The Commemorative Border will be at the bottom of ALL action images (print and electronic) unless requested otherwise. It WILL NOT cover anything on the print (see image), nor will it be on awards or portraits unless you request it in "Add a message to this order" at check out. Sign-up to have your runs photographed by filling out the information below. This is where Images will be posted Friday, September 9th! Portraits & Formal Award photos in folders by owner name. Teams will not be posted.